As a mum of three, my pelvic floor isn’t exactly what it used to be. As much as I know how important the exercises are, more often than not I forget to do them and after putting my body through three pregnancies over the past eight years, it’s hardly surprising it’s not up to shape lately. Having spoken to other mums, I know I’m not the only one facing this issue. Still, at twenty eight years old, I feel quite embarrassed to admit that occasionally doing exercises like star jumps can be a bit hit and miss. For me, personally, it’s not got to the point where I actually have accidents, but there have been a few near misses in the past, and it does have a knock on effect to your confidence. 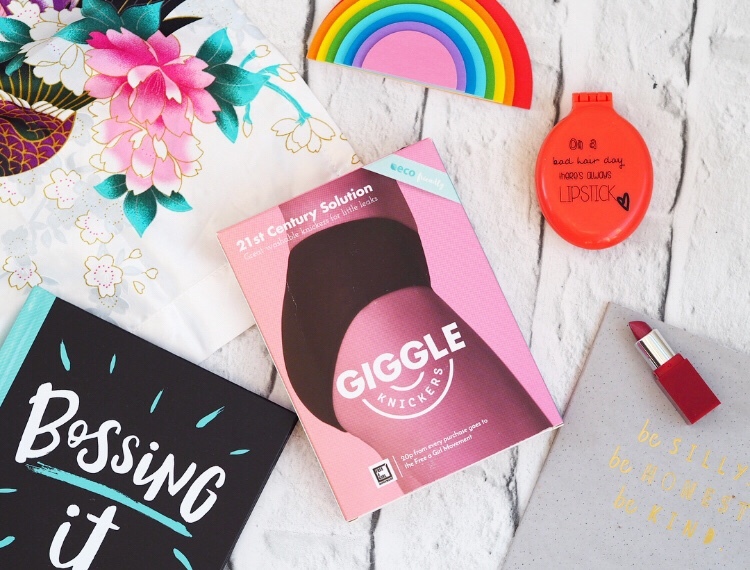 When the team at Giggle Knickers reached out and told me about their underwear for people in my situation, as an alternative to wearing disposable pads daily, I knew it was something I wanted to discuss on my blog, no matter how awkward a topic. The subject is one that isn’t spoken about enough, leaving women like me feeling isolated and ashamed. I want to remove the stigma attached to a weak pelvic floor, which is fairly common post childbirth, by talking about the problem openly and honestly. I was sent a pair of the Giggle Knickers, so that I could try them out for myself and see if they do what they claim to do. They arrived quickly, in packaging similar to other underwear I’ve bought online, with a really pretty pink box. The knickers are black in colour and are fairly big in size, but they are actually more stylish and discreet than I imagined, and are totally comfy to wear. If the current design isn’t your style, there are more designs in the pipeline (head to the website to vote for your favourite from boyshorts to bikini to thong). The knickers have a breathable, absorbent lining in the gusset, which helps to protect against any leaks or accidents that may happen whilst wearing them, keeping your clothes dry and clean. They are designed to hold up to 6 teaspoons of liquid – which is pretty impressive, and are machine washable. The knickers come in sizes XS to XL and are quite true to size. My pair are a small, which are suitable for size 8-10 and they fit me perfectly. The waistband is elasticated, which means that if you are between sizes, like me, the knickers should still fit nicely. Price wise, at £12.99 a pair, the knickers are more expensive than I would like for something that, let’s face it, you would wear once before popping in the wash. Although you would be saving on the cost of disposable pads, if you were looking at wearing the underwear everyday, you would be spending a fair amount on a few different pairs, which isn’t ideal. Having said that, postage to the UK is free and these knickers are not your standard underwear that can be bought on the highstreet and this is reflected in the design and quality materials used. As well as this, twenty pence from every sale also goes towards a very good cause – the Free a Girl movement, which fights against human-trafficking and sexual exploitation of young women. The knickers are also eco-friendly with recyclable packaging right down to the mailing bag. Will I continue using them? Perhaps not for everyday wear, but the knickers are brilliant for those activities that threaten to push your pelvic floor that little bit more. Until now, I would have totally shyed away from going to an indoor trampoline centre, or a group dance class, for fear of what might happen if my weak pelvic floor decided to give out on me. With Giggle Knickers, I have that extra peace of mind that, should anything happen, they literally have me covered. For the first time in ages, I feel I’ve got my confidence back. I am determined to work on my pelvic floor, but in the meantime, I am safe in the knowledge that Giggle Knickers have got my back. I was sent a pair of Giggle Knickers for the purpose of this review, however all opinions and photos are my own. This sounds like a really useful product, I will check it out for my mom!